Please pop in to Heritage Hub, at Unit 17, The Forum, Sittingbourne, ME10 3DL. This is the home of the HRGS ‘Research Room’ (which may be used by members by prior appointment). The ‘Exhibition Space’ is a collaborative project involving CSI Sittingbourne, Amtec , Canterbury Archaeological Trust, Sittingbourne Heritage Museum and the HRGS. Visitors to the exhibition will have the chance to see a selection of conserved finds from the Meads Anglo-Saxon Cemetery excavation, which was carried out by the Canterbury Archaeological Trust. There are also artefacts we make available to the public that can be handled to encourage all ages to be involved in Archaeology. An exhibition by the Archaeological Field Unit of HRGS. This was a Hidden Histories Community dig undertaken in June 2015 and a Young Roots project in 2016. Rose Hill House at The Grove, is an on-going project of a Georgian house that once stood on the hill over-looking the A2. Pop in and see our touch screen and find out about the ruins in the wood; and see if you can follow the self-guided walk to the find the mysterious house in the woods. A digital Roll of Honour of local men who fought in the First World War, funded by the HLF’s ‘Then & Now‘ programme. 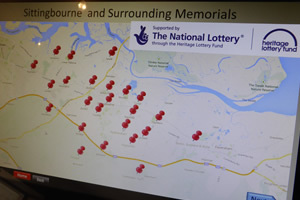 The hi-tech touch screen from contains hundreds of names and images. It is situated alongside a life-size replica of a First World War trench, created by students at the University for the Creative Arts. The project hopes that visitors from Sittingbourne and the surrounding area will be able to view, share, and preserve their family’s memories and heritage of the First World War, and the people who lived through it. If you have family or local photos, or you think your family name might be on the touch screen, please pop in and see us. Proud to be part of the Wheels of Time programme – encouraging familes to visit Kent’s Heritage. Wheelchair and child friendly.